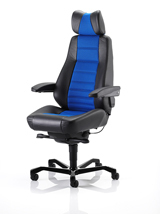 A 24 hour chair for primary use in surveillance and control stations but equally ideal in deluxe office environments. The standard version features a robust leather/fabric combination, providing maximum durability and comfort for 24/7 usage. Also available in a wide choice of specially selected fabrics and premium leathers. Buy the standard black leather KAB Controller online here with a choice of the following Xtreme fabric inserts, £784.80 + vat inc delivery (UK mainland addresses only).